Frank Jones’ photographs in RECORD 15 were as usual most interesting. May I suggest that the loco illustrated on page 100 is Fletcher Jennings 112 of 1873? I saw her at the North Bitchburn Colliery (North Bitchburn Fireclay Co Ltd) at Hunwick, Co. Durham, on 5th August 1939, in roughly similar surroundings, and believe she survived for some years afterwards. I came to the conclusion some time ago that HARE (illustrated on page 101) was a Gibb & Hogg loco. According to the records at Parson Byers, inspected during a visit in 1953, it had arrived at Newlandside Quarry by September 1914 and the boiler was by Anderson & Son, Carfin, in 1908. Possibly this firm regularly made boilers for Gibb & Hogg. With reference to the article in RECORD 7 and subsequent correspondence on page 310 (RECORD 12) and page 118 (RECORD 15), ELECTRIC No.1 was not scrapped in 1934 as I saw her at Philadelphia on 5th August 1936. I was told then that it was for scrap "owing to a change in the electric supply system" – my note at the time. With reference to your quotation from "History of the Manchester Ship Canal" which appeared in RECORD 15, page 105, I wonder if GARSTON was a reporting error for GUSTON which has been recorded on this contract. It would sound very similar to the ear and GUSTON would not be a name that meant anything to the locals. 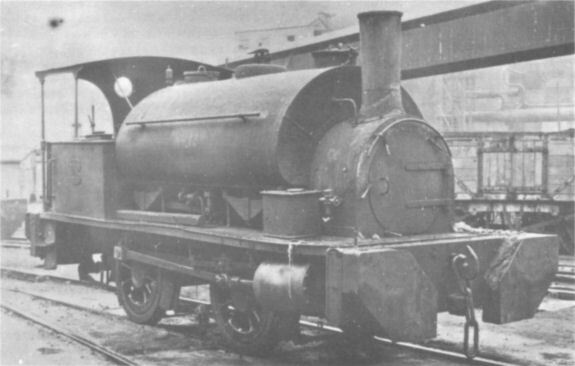 GUSTON was a Manning Wardle class F 0–4–0 saddle tank. Works number 716, despatched new to T. A. Walker on 19th December 1878 for use on the construction of the Dover (Buckland Junction) to Deal section of the London, Chatham & Dover Railway; Guston tunnel is near the summit. A group of the Railway Preservation Society (Midlands Area) has agreed to try to purchase the second oldest Neilson locomotive still in existence. It is Baird & Scottish Steel Ltd’s No.11 (Neilson 2937 of 1882) at Gartsherrie Ironworks, near Glasgow. This locomotive is in working order and, with spares available from the other Neilson Reid locomotives at Gartsherrie, could work on the Society’s line at Chasewater, near Lichfield, in 1968. The cost of the locomotive and transport to Chasewater total £300 which is somewhat outside our reach. May I appeal to your readers for donations to this worthy appeal from a well established Society? All monies should be sent to G. Wildish, c/o Darlington Memorial Hospital, Darlington, Co. Durham. Cheques should be crossed "Neilson locomotive account", and all donations will be acknowledged. I have no further information on the Baldwin locomotive illustrated on page 16 of RECORD 13, but in reply I have listed the Baldwins known to have worked in this country, other than the 2–8–0’s of the USATC of which none stayed behind after World War 2 ended. The grand total of ninety-three includes seventy-five standard gauge examples of which thirty went to the Midland Railway in 1898, and twenty to both the Great Northern and Great Central Railways in 1899 (all seventy being 2–6–0’s). The remaining five comprised the LOVETT EAMES (an 1880 4–2–2 which ran trials on the Lancashire & Yorkshire and Great Northern Railways in 1882 to advertise the Eames Vacuum Brake); a 4–wheel electric built in 1903 for the Newcastle-upon-Tyne Electric Supply Co. Ltd., and scrapped at Carville Power Station in 1960; and three 0–6–0 side tanks on the War Department tramway at Shoeburyness. The narrow gauge examples were owned by the Lynton & Barnstaple Rly (1), Oakbank Oil Co (2), Ashover Light Ry (6), British Standard Cement Co Ltd (1), Festiniog Rly (2), Glyn Valley Tramway (1), Penrhyn Quaries (3), and the Snailbeach District Rlys (2). In answer to the query in the letter from R. Abbott (RECORD 15) as to whether this firm built ordinary as well as tramway type locomotives it would seem from the notes to my copy of the works list that this was unlikely. Subsequent to the first loco which was the Grantham double-deck car used on the Wantage tramway all locos in the list were of the enclosed tramway type of 0–4–0 with well-tanks. However a separate list of fire engines was kept and so possibly there may have been a third list for ordinary locos such as the 0−4–0 saddle tank illustrated in the 1882 catalogue.